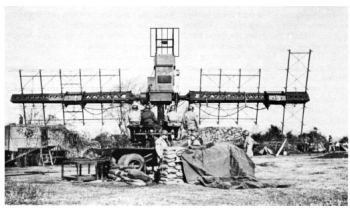 The SCR-268 was the Army's first radar, designed to direct searchlights and antiaircraft guns. It used lobe switching to achieve a high directional accuracy and was standard equipment in 90mm antiaircraft batteries as late as January 1944, in spite of problems with the accuracy of its elevation data due to ground reflections. An SCR-268 was present at Corregidor and fell into Japanese hands with the fall of that fortress. It was shipped to Japan and gave the Japanese their first indications that they had fallen seriously behind in radar technology.